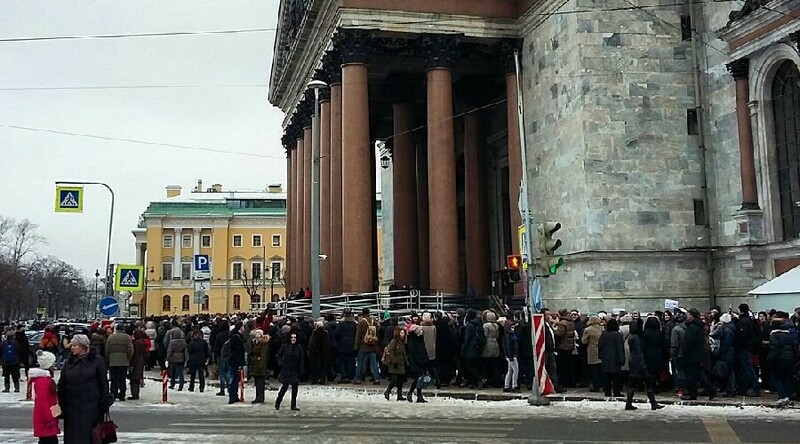 Hundreds of people on Sunday gathered near one of the main landmarks in St. Petersburg, Russia – St. Isaac's cathedral, the city’s most prominent religious museum. While one group came to celebrate the city authorities' decision to give the historic building to the Russian Orthodox Church, others protested against the move. Participants of the anti-transition rally on Sunday were chanting "Museum! Museum!" as they formed a triple circle around the landmark, local media reported. Judging by the size of the cathedral, up to 3,000 people might have taken part, according to participants' estimates, as cited by the St. Petersburg-based Fontanka newspaper. Earlier in the day, hundreds of people participated in a procession at the cathedral to support the handover. At least 500 believers joined the sacred procession led by Russian Orthodox Church officials around the cathedral, singing prayers, Ruptly reported. The anti-handover gathering, which went under the title of "Blue ring," in reference to the blue ribbons worn by its participants, was also peaceful, with no incidents or arrests reported, according to Abnews.ru. The ribbon is the symbol of protecting the city’s heritage and its citizens' interests. The rally had not been sanctioned by authorities, Fontanka said, but police did not interfere as its organizers had pronounced it a meeting of deputies with the voters. At least two deputies who are against the handover of the cathedral were present at the gathering. They promised to try and organize a referendum on the issue, according to Abnews.ru. Снова много-много лучших людей города. MP Maksim Reznik, who was among those who delivered a speech at the rally, told the media that the issue had become "one of the main problems in the country." At the promised referendum, its initiators also plan to hold a vote of no confidence in St. Petersburg Governor Georgy Poltavchenko, who made the decision on the cathedral's transition in late December last year. The decision to hand over St. Isaac’s cathedral to the Church was announced in early January. It has triggered hot debates, especially among people living in the city which is known as Russia's cultural capital. "I ask the leadership of the Russian Orthodox Church to come forward with a sensible attitude and at least put off the decision, for the sake of peace in the city," a woman at the rally said, as cited by Bumaga newspaper. She said, "Passions are rising... and the city has been split in two, which is potentially very dangerous." Russian Orthodox Church officials have maintained that the cathedral will not only continue its museum functions, but even improve them.